This photo was taken on January 2, 2016 at 5:54 AM. The location was in the driveway of a very elegant hotel in Georgetown, Washington DC. The "Take It!" came as I had very purposly parked my car under the overhead lights in order to pacify the car as it had been complaining that it did not have any of those strings of accent lights that are showing up around the headlights of some of the more expensive cars. These lights seem to be the latest way to pretty up what ever the make may be. It is interesting to see what form they take and how they actually look as they approach you at night, while looking at them in one's rear view mirror. The After Take: The car got a laugh out of my doing this over kill application and seemed to think that it would make due just the way it is. For this, I am thankful as it really is a very neat and smart car. That it unlocks the doors and turns on the interior lights as I get close to the car just because I have the key fob in my pocket - is simply amazing. Ah, the joy of being able to share a lighter moment is sublime. Wishing you all happy times with your vehicle, whatever it might be. Your license plate is great, HA! 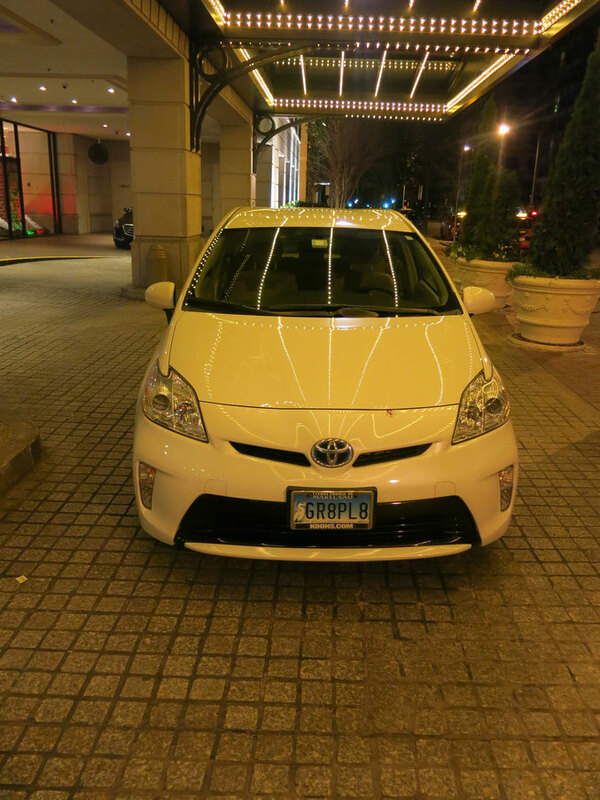 The light patterns all seem to converge onto the Toyota symbol on the front of the car, very cool. We got a good laugh from your plates. What a very pretty picture, it has a lot going on in it. The light show on the hood looks epic!! Also, I too have a Prius. Mine is 7 years old and runs like a champ, great cars! Great use of light, Bruce! Impressive!